North Pacific Coast Railroad built a cab-forward (locomotive number 21) in their Sausalito Shops in 1901. Its poor weight distribution caused it to be very slippery. It was in service for only a few years before being scrapped. The following book has a good photograph of 21 on page 94. Narrow Gauge to the Redwoods, by A. Bray Dickinson, Trans-Anglo Books, Lib of Congress 66-297565. The French Chemin de Fer de la Baie de Somme, a meter gauge line in north France by the North Sea, used to have roadside lines where good visibility was necessary. A small (0-6-2T) cab forward was designed. #3714, was probably the last cab forward in operation on this line. It had controls (whistle, brake) oriented toward the cab end. 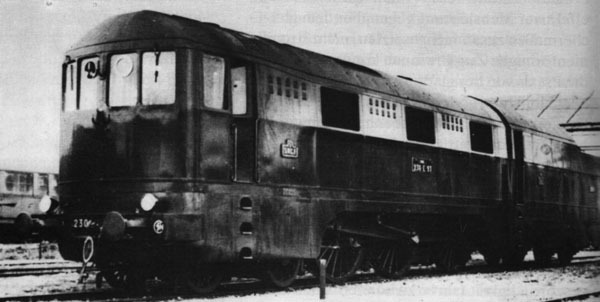 Recently (1998), sister locomotive #3712 was found in Brazil, lost for more than 90 years. There are hopes to bring this locomotive back to France and restore it to operating condition. Information and pictures may at some time become available here. There was one cab forward in service in Germany and several in Prussia. The one in Germany was different from the SP cab forwards in that it was not articulated. 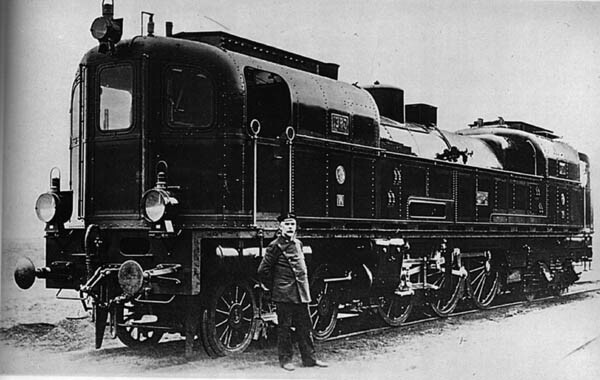 Only one was built as one of the 05-series steamers. There were only 3 05s built around 1935-36. They were designed for high speed and were all streamlined 3-cylinder hudsons. Another distinction was that they were painted red. In 1936 05-002 set a world speed record for steamers with 200.4 km/h only to be surpassed one or two years later by Mallard with 204 km/h (I believe). One of the three 05s (05-003) was designed as a cab forward and as another oddity it was fueled by coal dust. After WWII 05-003 was rebuilt into a traditional steamer (stripped of the streamlining and the cab moved to the back) and was in service until 1958 when it was scrapped together with 05-002. In 1958, in need of boiler repairs, 05-001 was taken out of service and refitted with its streamline shell before being moved to the Transportation Museum in Nuremberg. It looks as if in top shape, but it is not in operating condition. The above information about the German cab forward was supplied by Wolfgang Puchalski. The Italians also had a class of 43 cab forwards called the Gruppo 670. They were 4-6-0s with a six wheel tender for water only. The coal was carried in a bunker above and alongside the firebox. The engines were four cylinder Plancher compounds and hauled passenger trains down the east coast of Italy. There was also a single Gr 672 built that was similar, but was used to try out the Franco system of pre-heating the feed water. All the above engines were affectionately known by their crews as "Muccas" (Cows!). Gruppo 670 was built as the Rete Adriatica group 500, and was renumbered to group 690 when several private locomotive manufacturers (Rete Adriatica, Rete Mediterranea, Rete Sicula, and part of Society Veneta) were combined to form Ferrovie dello Statos, a state-owned company. 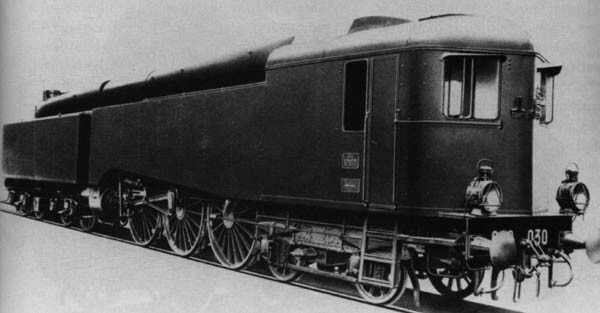 Gr 672 was both a cab forward and a streamlined engine. The steamlining was meant to hide the Franco feedwater heater. It also had a different boiler from standard 670s, with shorter heating pipes to compensate for the preheater ones. There was also a class of four cylinder 0-10-0s, also Planchers, built for banking duties north out of Genoa that were Tank engines with the coal supply located as on the Gr 670, but all their water supply was carried in four wheel tenders that could be positioned at either end of the engine, so that sometimes they too were cab forwards. They were originally designed like that because of legislation that decreed that between loco and train there had to be an empty wagon, which wasn't helpful on steeply graded lines so the "tender" sufficed. Most of these were eventually converted to conventional tender engines, but 470.092 survived in original condition in the Science Museum in Milan. The above information about the Italian cab forwards was supplied by Bill Read and Gian Uberto Lauri. In 1902/03 a competition of the Verein Deutscher Maschineningenieure was held with the aim to design a locomotive which would be able to pull a 180 ton train at 120 km/h and also would have a top speed of 150 km/h. 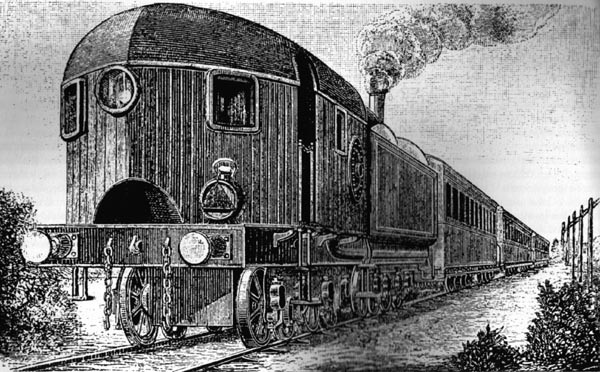 The design of a locomotive with two cabs by Oberingenieur Kuhn and Geheimer Oberbaurat Wittfeld was realized by Henschel (a well-known locomotive factory) in 1904. Two locomotives were built and numbered as "Altona 561" with complete fairing and "Altona 562" with a gallery between the streamlined cabs. The inner cylinder sat above the front bogie and drove the first of the coupled axles, the outer cylinders drove the second one. The locomotives reached 137 km/h with a train of 109 tons. Their performance was not satisfactorily, and therefore both locomotives went out of service around 1918. In 1903 a locomotive was ordered which would pull 180 - 200 tons on a 1:100 grade at 75 km/h and run 90 km/h on level tracks. Henschel built such an engine in 1904, it was the only Prussian four-cylinder compound engine with superheating at this time. It was fitted with two cabins, but this was considered a drawback because the engineer and fireman could only work together in one direction, and a third man was needed to watch the tracks. Besides, the locomotive - which was 20 years ahead of its time - turned out to be too heavy. It was returned to the factory and was scrapped. The above information about the German cab forward was supplied by Jan-Martin Hertzsch. The Russian cab forwards featured a combined steam and diesel propulsion with the diesel cylinders heating the boiler for the steam. The Glyn Valley 'Tramway' had three original cab-forward locomotives much modelled by us narrow-gauge modellers. Built by Beyer Peacock they were legally required to be run cab forwards as the 'Tramway' ran either beside and sometimes on the roadways, in order to provide better visibility. They also had to be quiet, have skirts to hide all moving parts which might frighten the horses and not emit steam which could do the same. As originally built the cabs were open at the 'back' ie facing the boiler/chimney to discourage 'forwards' running. Personally I think they look like a steam powered hovercraft when running. After a while operating standards became less restrictive and they had the open cab section filled and were allowed to run either way. Information provided by David Young.